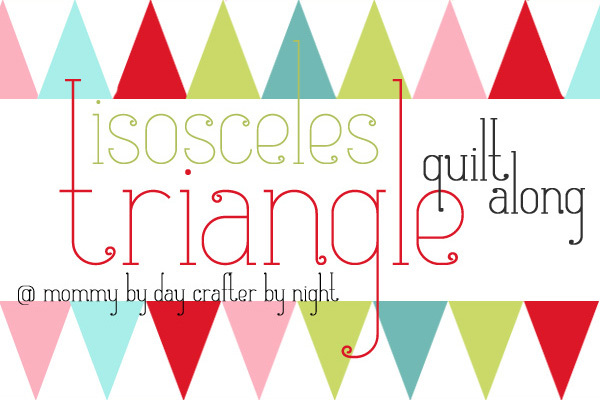 Mommy by day Crafter by night: Isosceles Triangle Quilt Along... the supplies. 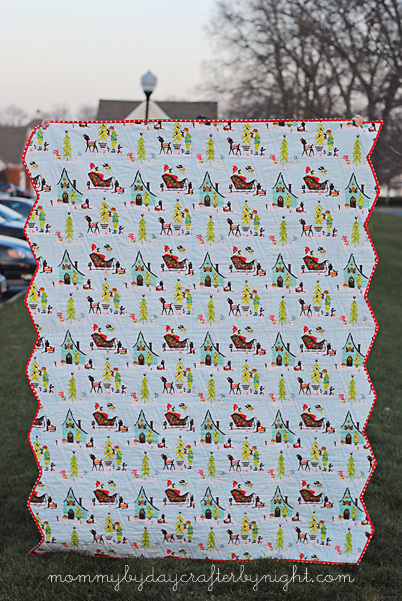 I made one Christmas quilt but gave it away. 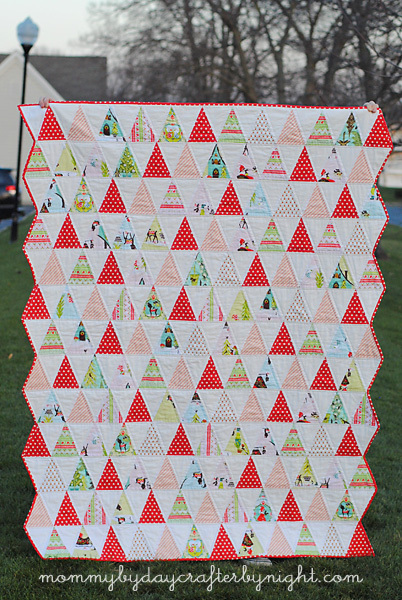 Maybe it's time to make one for myself using my Santa's Coming to Town FQs :). Can't wait to get started! LOVE your edge! 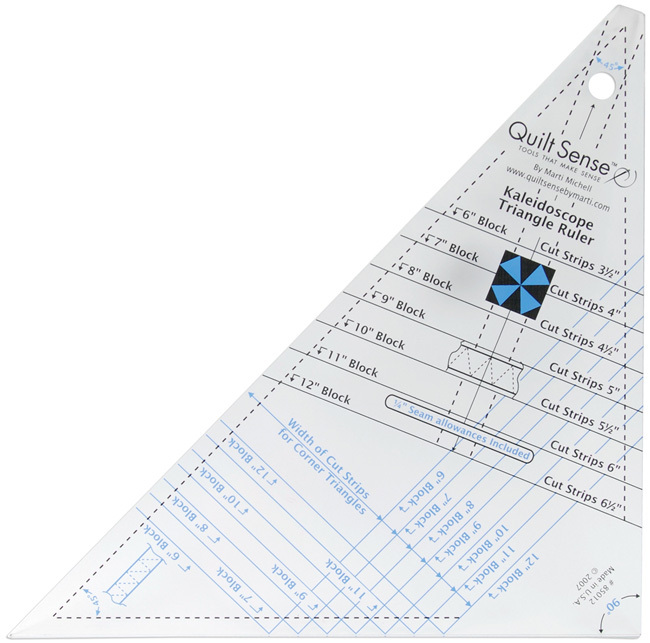 I'm hoping to quilt along as I'm infatuated with triangles right now. I have made an equilateral quilt, but not an isosceles so I must rectify that! gorgeous! 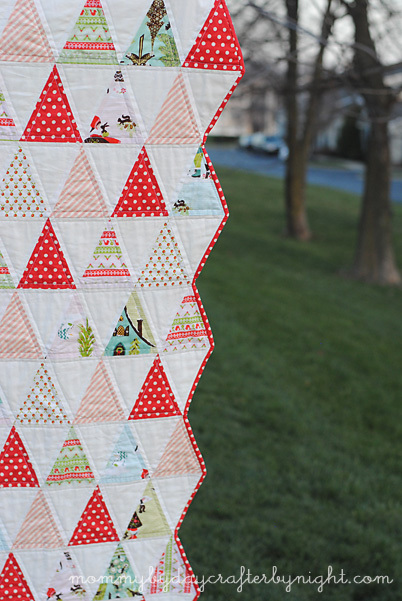 I'm currently doing my first quilt also with triangles--although much smaller than yours! so I was so excited to see this! 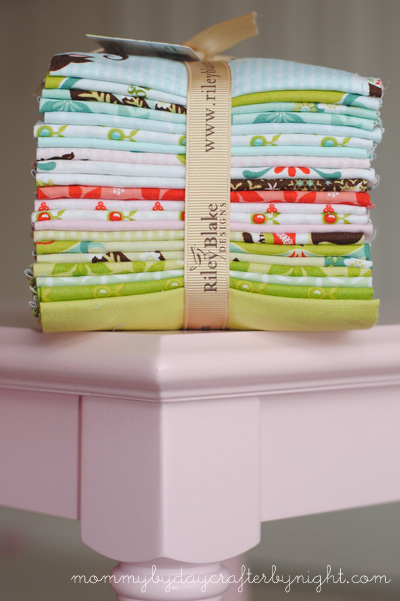 Ash, if you opened a store of all the darling quilts and things you have made, it would be my favorite shop ever. You have the best taste. Everything you do is so darling. Your little girls are so lucky to have such a talented Mommy. Miss you!! This is gorgeous!! I agree that you have exquisite taste! I'd love to see fabric bundles or collections from you!!! : ) I love this quilt! This is beautiful! You are so talented! Love!! It is so beautiful!!! Absolutely loved your quilt. Is it possible to be addicted to wonderful fabric? I love the smell, the feel, and the look of a great piece of fabric just waiting to be gathered into a beautiful and whimsical design. Thank you for inspiring me and feeding my addiction. Thanks for sharing! Love this beautiful quilt!!! I love this quilt. Your edges are amazing. I've never seen a quilt with such fun edges. And I love the fabric line. I think I'm going to have to make this one! I love everything about your quilt, I want to join the quilt along! I love the edging. It is SPECTACULAR!! I love this quilt! I love the edging and I love the way the triangles make the shape for the edge. Also, who can resist this fabric. LOVE! That is so cute! I want to make something like this, one day! This is adorable, I would love to make this for my mom for christmas.... Pick me! I just love how whimsical this blanket is. It's perfect for the holidays. This is BEAUTIFUL!!! I need to make one! Very fun! Love the vintage feel of it! Beautiful! So very adorable, I love it! This quilt is beautiful! I have Christmas fabric that I've been waiting years to use with the right pattern. Maybe this is the one. 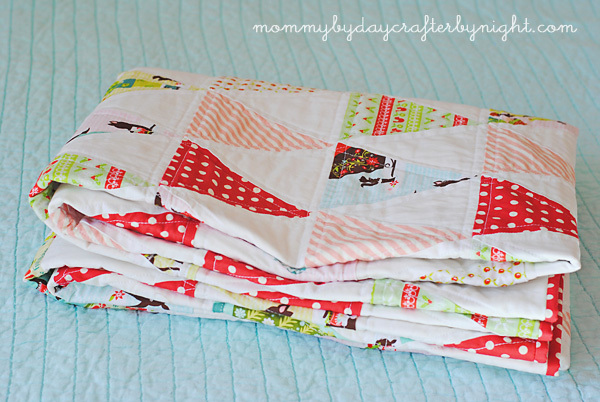 Your quilt is beautiful, and thank you so much for sharing how to make it! Your talents amaze and inspire me. Oh man! I really want to join. I'm still trying to get the borders on the zig-zag quilt along I did from your blog! I need more free time :) It's beautiful! i love this quilt! thanks for posting! found you via pinterest. 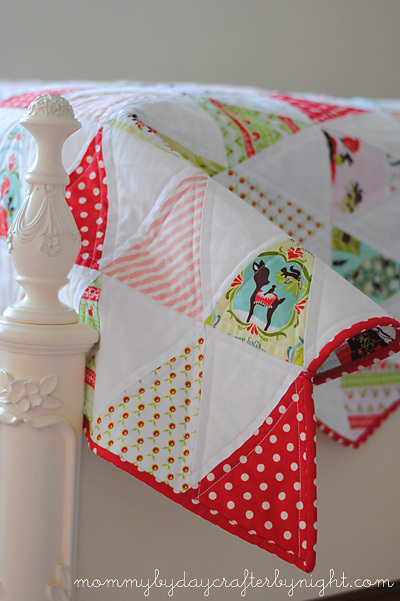 This quilt is so adorable! 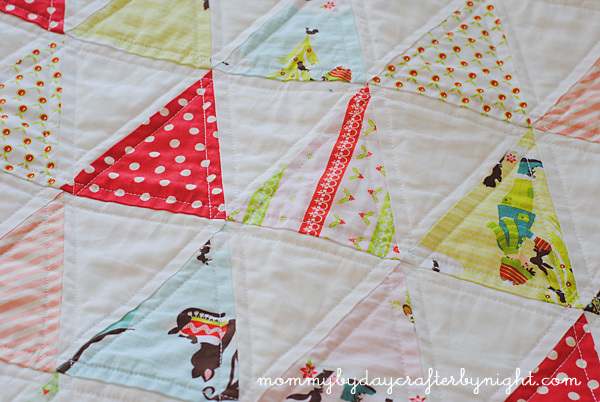 I love the edges of this triangle quilt! Very Unique! You finished it! I Iove it! It's beautiful! I didn't notice the darling edges when we were there. Perfect touch! That is beautiful. I love the zig zag edge! This is an awesome quilt, Ashley! Enjoy following your work!